The USS OKINAWA (LPH-3), an Iwo Jima-class amphibious assault ship, was commissioned on 14 APR 1962. USS OKINAWA served her country for 30 years, 8 months and 3 days, until decommissioned on 17 DEC 1992. After fit out and shake down, OKINAWA's first call to service was the Cuban Missile Crisis in October 1962. East Coast service continued until January 1967 when she shifted home port to San Diego due to the massing of naval forces for the struggle in Vietnam. During her service career OKINAWA deployed numerous times to the the Western Pacific, recovered an Apollo space capsule and supported the effort in the Persian Gulf during the First Gulf War. After a thirty year career, she was sunk as a target in a fleet exercise off California, on June 6, 2002 - the 58th anniversary of D-Day. NOV 1964 - DEC 1964 u.s.m.c. 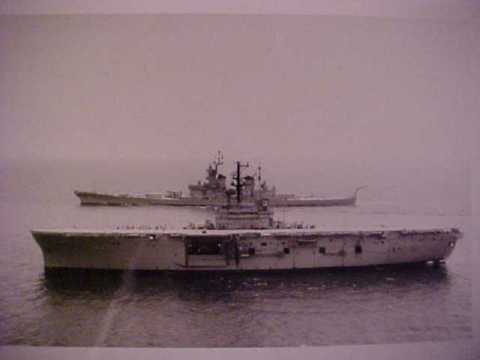 Okinawa (LPH-3) was laid down 1 April 1960 (15th anniversary of the invasion of Okinawa) by the Philadelphia Naval Shipyard Philadelphia Pa.; launched 19 August 1961; sponsored by Mrs. John L. McClellan wife of the Senator from Arkansas; and com missioned 14 April 1962 Capt. William E. Lemos in command. Following commissioning and sea trials Okinawa departed Philadelphia 20 June 1962 for her homeport Norfolk where she spent a month fitting out. After a six-week shakedown cruise out of Guantanamo Bay and another month in Norfolk the amphibious assault ship began participation in her first fleet exercise in the Caribbean 15 October. Shortly thereafter the Cuban Quarantine was placed in effect and Okinawa remained in the area lending force to the United States' stand until 3 December wh en she returned to Norfolk. The first half of 1963 was spent in availability at the Philadelphia and Norfolk Naval Shipyards and further trial operations in the Caribbean and out of Norfolk. On 9 July Okinawa began her first formal Caribbean deployment returning to Norfolk 1 October and spending the remainder of that year and the first part of the next in that area. During June 1964 she sailed to Newport R.I. and New York for the World's Fair. On 7 October she left on her first trip to European waters for operation "Steel Pike I " an amphibious exercise off the coast of Spain. After a stop in France and a goodwill visit to Plymouth England Okinawa arrived back in Norfolk at the end of November. In April 1965 while participating in an exercise off Puerto Rico Okinawa was alerted and sent to an area off the Dominican Republic to act as medical evacuation ship with her marines as a floating reserve during the crisis in that troubled countr y. Then following the end of her deployment she proceeded via Norfolk to Philadelphia for overhaul. The following April she returned to Norfolk and began her third Caribbean deployment on 13 June. Okinawa transferred to the Pacific Fleet sailing 24 January 1967 for the West Coast and arriving San Diego her new home port 8 February. Okinawa left on 10 March for her first deployment off Vietnam. On 13 April while sailing from Okinawa to Taiwan the ship was diverted by a distress call and the next day rescued all 38 persons from the grounded Panamanian vessel Silver Peak near the Sento Shosho Islands. While off Vietnam Okinawa was a mobile base from which a well-equipped force of marines could quickly strike via helicopters at the Communist insurgents. She returned to San Diego 5 December. On 4 April 1968 after an intensive period of special training Okinawa recovered the unmanned Apollo VI space capsule 380 miles north of Kauai Hawaii. With further exercises and upkeep she conducted her second Westpac deployment from 2 November to 26 June 1969 when she arrived in San Diego for leave and upkeep. Okinawa continues her role in support of freedom at home and abroad alternating duty in home waters with deployments to the Far East into 1970.